Somewhere in the outskirts of Elk Grove California, Doug Kauer is sitting behind his computer cracking up at his bank account history while going over his yearly expenses in time for tax season. Whoever said building a Volvo monster was cheap? Well we did, but we also never planned for one of the sexiest looking 242’s in North America either. This 1982 242 Turbo is the byproduct of spending years tuning old American Muscle cars, first-gen Firebirds to be exact, obviously a car you don’t want as a daily driver. That’s where the Volvos came into play. 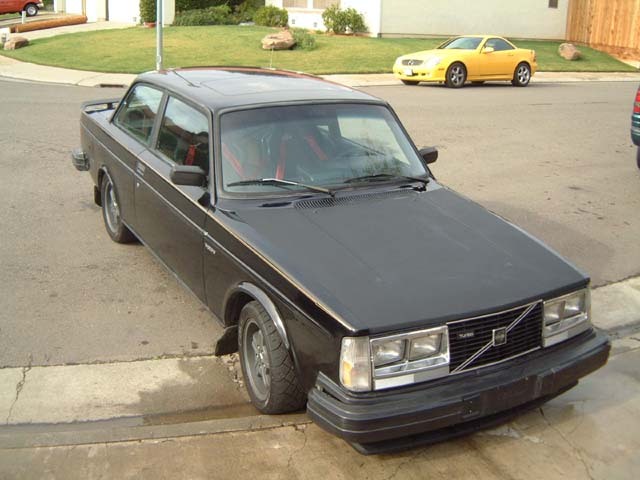 Doug started with a ’87 244 DL which served its purpose up until it required more attention then his projects, at which point he ditched the projects and sold off his 69 Firebird 400 and picked up a nice new S60. All this in hopes that he could divert his attention away from his addiction towards a long term relationship with an automobile. Unfortunately for him (fortunately for us), he couldn't keep away for very long. 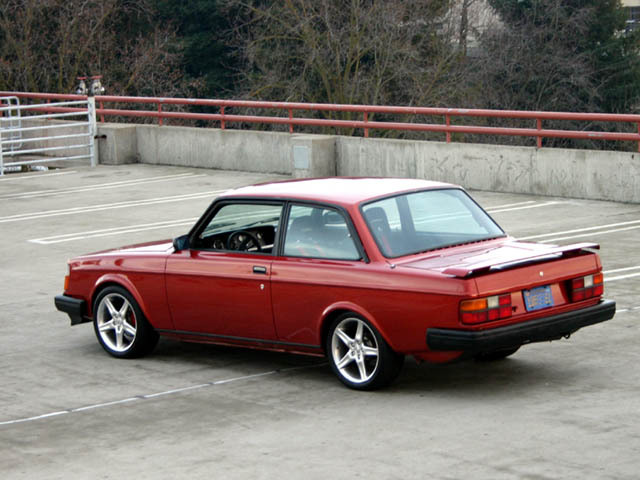 He had a lead on a run down 242 that one of his friends was trying to pawn off on unsuspecting Volvo nuts. So in August of 2002 the 242 project began down its path to becoming the Frankenstein concept it is today. Some of the original plans were to piece together a pleasantly quick street legal racer on a budget. Something you could drive around and beat up on the local import tuners. That idea quickly went down the drain when Doug realized that a gigantic Holset turbo would fit perfectly on his B21FT and thus started the chain reaction of engine upgrades. After adding an NPR intercooler, B230 intake manifold, and TurboXS Type H BOV, It became quite obvious right off the bat that the fuel system wasn’t going to cut it. So in hopes of keeping with the ideals of the project he decided to go for the build-it-yourself fuel management system, MegaSquirt, which a few other local members had been working on setup and tuning. With the ability to accurately tune the fuel curves and eliminate the problems with intake restrictions in combination with some 56 lb/hr Lucas injectors the motor finally got off the ground… literally. After a few head gaskets and other pieces not holding up against the upgraded parts, it was apparent he needed to put the car on hold and do a major overhaul. The first step was to get the car at least looking well enough to put on a show. The front was converted to an earlier style “flathood” style with the euro turn signals. A touch of American iron was bolted to the trunk in the form of a ’87 Trans AM spoiler. The body was stripped down and painted “Sunset Metallic Orange”. Everything was changed over to black interior, a pair of Corbeau CR1’s were added with 4 point belts. 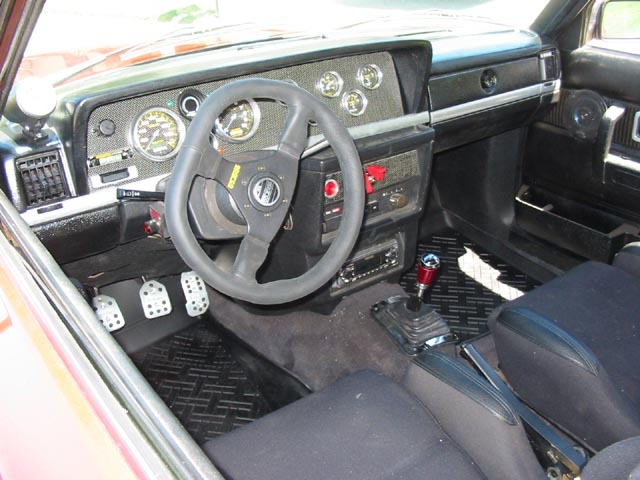 The dash was completely redone in custom carbon fiber paneling and a wide range of Autometer carbon fiber gauges were fitted. Just recently the car received a custom stereo system installed with a Pioneer 6300 deck, Kenwood 4” 2 way speakers up front and 6x9 3 ways in the rear. All powered by two Pioneer 200w amps. Twin Polk 10” momo subs were molded into the trunk powered by an Alpine 600w amp. A set of Moda R6 17x7.5” wheels were fitted with 225/45-17 Pirelli’s and slapped on some cross drilled Brembo rotors. The rest of the suspension was done up with IPD sport springs and IPD 25mm sway bars front and back with solid end links, as well as the GT strut braces. MVP Volvo PolyUrethane bushings replaced most of the rubber under the car. An adjustable panhard rod as well as some Noltec Camber plates were also tossed in the mix. An already ported and polished 398 head got an Enem K15 cam installed as well as a new exhaust manifold from Proturbo in Finland to help provide an even larger Holset HY35W turbo with the needed exhaust flow. A new 2.3L block was rebuilt and fitted in place of the smaller 2.1L for additional low end torque and then added a 4” downpipe to a 3” cat and side exit exhaust were added to help spool. A Tial 38mm external wastegate replaced the internally vented option on the turbo, controlled by a Blitz EBC-S electronic boost controller. In order to hold the excessive torque a Ford Mustang T5 transmission with a Pro5.0 shifter was retrofitted. As well as a 9 lb aluminum flywheel matched with a ClutchNet carbon clutch with the help of veteran Volvo fabricator V-Performance along with a 1 piece driveshaft. So far the car in whatever state of “completeness” has made its way into numerous car shows on the west coast and grabbed the attention of a few manufactures in hopes that one day their name can be slapped across the side in vinyl. 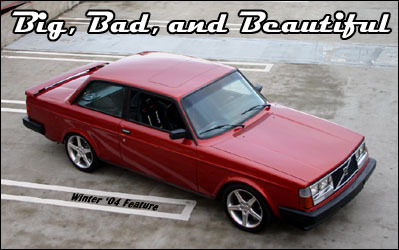 Hopefully we’ll get to see more of Doug’s creation as it brings Volvo fanatics around the US some publicity to the rest of the tuner community. I really need to thank the folks at http://www.clubvolvo.com with out them, my car wouldn’t be what it is now. I would also like to thank Dave Lotman, Ian R, Dale and Matt from Avalanche, Pat Dickman, and numerous other people who have been invaluable through out the build up of this car. Thanks everyone! 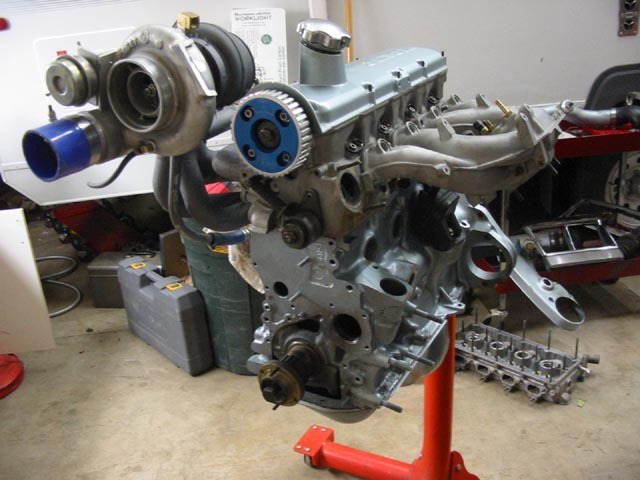 Motor: Rebuilt b23ft, Decked and Oringed topped with a ported & polished 398 head. Enem K15 cam 298* duration, 12.8mm lift spools the Holset HY35W turbo with a Tial 38mm wastegate. The exhaust consists of a 4” down pipe, 3” Catco Cat, 3” Dynamax Bullet Muffler straight out the passenger side. 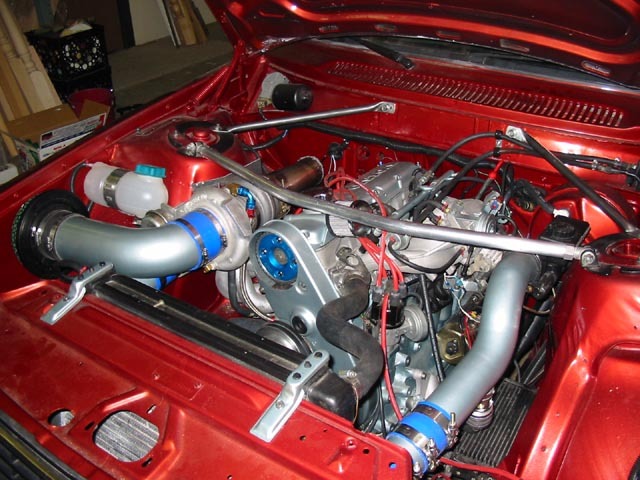 An Innovatemotorsports Wideband o2 sensor helps tune the Megasquirt EMS w/ 56lb/hr lucas injectors. An NPR Intercooler and 230 intake feed the motor the air it needs. A TurboXS TypeH BOV HKS Turbo Timer Blitz EBC-S boost controller MSD 8mm wires complete the electronics portion of this twisted project. Transmission: A 1991 5.0 T5 mustang gear box was adapted and stuffed with a ClutchNet custom clutch (carbon/carbon) 9lb aluminum flywheel (custom built by www.v-performance.com). The 1pc driveshaft and Pro5.0 Sport Shifter were added on once everything was in place. 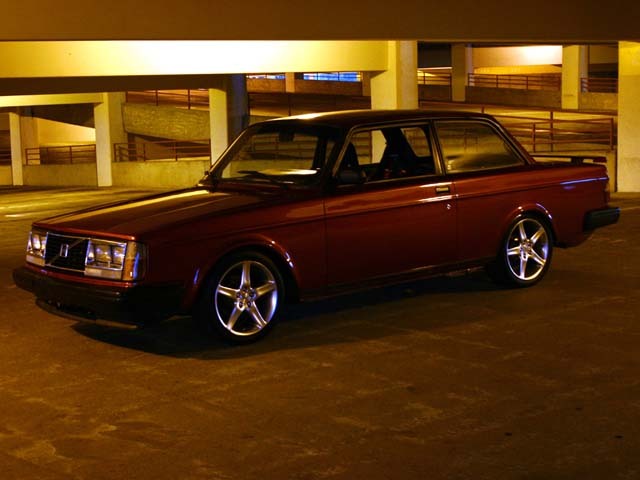 Suspension: IPD supplied the Sport springs, 25mm front/rear sway bars, and the strutbraces while MVP Volvo hooked up the poly bushings, Adjustable panhard rod, and Solid Sway Bar End Links. Bilstien Shocks were added to keep things stable at high speeds. Wheels & Brakes: Custom Cross-drilled Brembo Rotors and PBR Deluxe Pads and Stainless Steel brake lines help keep the car on the road. A set of Moda R6 17x7.5" wheels with 225/45-17 Pirelli P7000 tires add a nice touch. 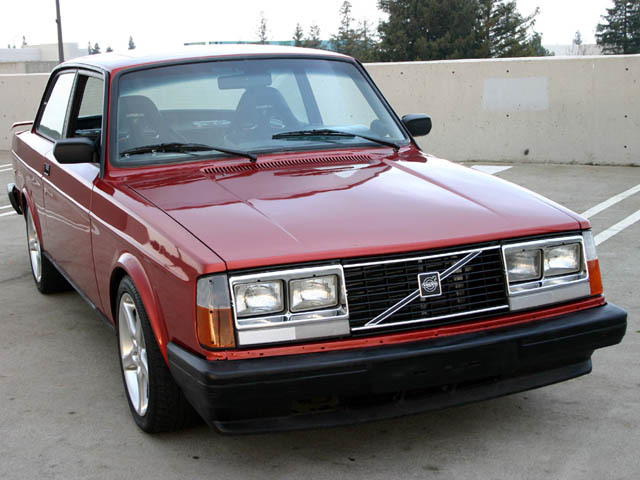 Cosmetic: The front end was converted to a "flathood" with euro front signals and the limited edition grille. A 1987 Trans Am wing on the trunk, the waist line trim removed, and getting it painted Sunset Metallic Orange gave it a whole new look.